Freeway lids are growing in popularity as an urban design solution for the challenges and opportunities by sunken city freeways. While Freeway Park, opened in 1976, is often cited as the earliest example, similar projects in New York and California preceded it and Philadelphia opened two other lid parks the same year. Lid projects are not necessarily just used to create parks, but also convention centers, government offices, housing, and commercial spaces. Within the last decade the idea has accelerated, and there now nearly three dozen completed projects across the United States and at least another dozen proposed or in the planning and design stages. The map below illustrates the prevelance of freeway lids across the country. Red dots are completed projects, and green dots are proposed. Click a dot for details about each lid project. The selected case studies listed below (in no particular order) represent the best completed and planned projects around the nation. They provide inspiration for design, data for cost estimating and engineering, and prove that freeway lids have been done before and can be done again right here in Seattle. More information about lids completed and planned in the Puget Sound region can be found on the History page. Image courtesy of Woodall Rogers Freeway Foundation. Recognized by the Urban Land Institutes’s 2014 Urban Open Space Award, Klyde Warren Park has transformed the arts and culture hub of Downtown Dallas. It was built over eight lanes of a sunken state freeway, and one overpass was closed to make a larger continuous open space. The park has unrestricted access from sidewalks around the entire perimeter and limited plantings preserve sight lines in and out of the park, making it highly safe and accessible. According to the Trust for Public Land, per acre it is among the top ten most-visited parks in the country. While owned by the public, it is managed by a non-profit entity that employs custodians, security guards, and event planners to keep the park clean and active all day long. A built-in restaurant and food truck parking attracts visitors and generates maintenance and operations funding. The park is programmed with family-friendly events like concerts and markets throughout the year, and it benefits from its proximity to nearby museums and art galleries. Half of the project cost was covered by a mix variety of federal, state, and local funding, and an astonishing 48 percent of came from private donations. Image courtesy of Friends of Hollywood Central Park. The largest ever lid park ever conceived will reconnect the Hollywood neighborhood over one mile of U.S. Highway 101. The project seeks to dramatically increase public health for disadvantaged communities by providing exercise and recreation space within walking distance of 180,000 residents. The park will have fields, pathways, ballfields, playgrounds, and an amphitheater. Planning is also underway to integrate surrounding land uses and improve local transportation and utility infrastructure. Now going through environmental review, the project is the furthest along of six separate lid proposals in the Los Angeles region. Construction is anticipated to begin in 2017 and last four to five years. About 60 percent of project funding is expected to be public, with none coming from the City of Los Angeles; most public funding will be covered by the federal government since the area is part of a designated Promise Zone. The other 40 percent of funding is expected from private donations. Image courtesy of Property Group Partners. This freeway lid is part of a $1.3 billion private development in the heart of the nation’s capitol. The endeavor is entirely privately financed and will support 2.2 million square feet of office, retail, and residential space spread across five LEED Platinum buildings on a lid over Interstate 395. 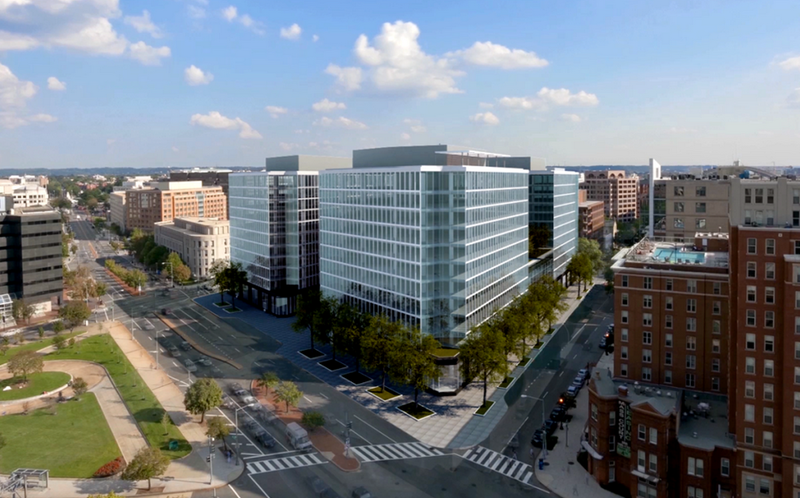 Capitol Crossing will also reconnect two streets and includes new freeway ramps and utility improvements. This lid is notable for consisting mainly of private multi-story buildings, rather than the park space seen in other case studies. This alternative was pursued because Washington, D.C. already has a significant amount of urban park space (the site is adjacent to the National Mall). The developer projects 10,000 people will work or live at the project when it is completed by 2021. First proposed in 2002, this complex 4.5 acre private development over the Massachusetts Turnpike (Interstate 90) broke ground on its first phase in early 2018. This phase includes development on both solid ground and a 12,000 square foot lid over the freeway, supporting a pedestrian walkway above a rebuilt commuter rail station. The first phase consists of two buildings with 312 apartments and 37,000 square feet of retail space. Between Beacon Street and Brookline Avenue, the second phase will consist of two residential buildings and parking garage over the Turnpike. Fenway Center will feature one of the largest private solar power plants in Massachusetts and will incorporate many green building features. Image courtesy of City Arch Park Foundation. This project reconnected Downtown St. Louis with its riverfront and the Gateway Arch national monument. Part of a larger reimagining of the monument grounds, the small land bridge spans six lanes of Interstate 44 and creates a seamless pedestrian connection between the historic courthouse and riverfront. 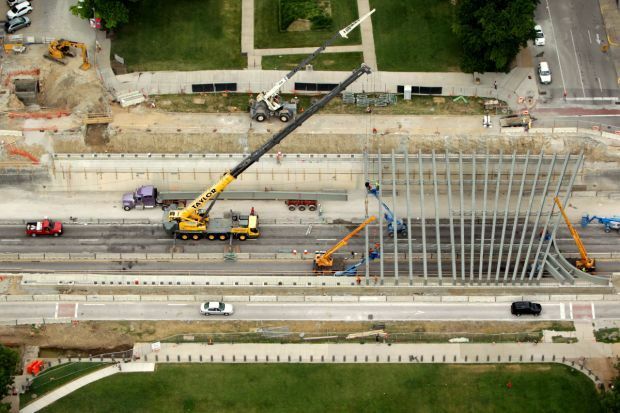 The highway was closed for only one weekend to place 40 girders that span 100 feet and weight 14 tons each. The state highway department also integrated improvements to freeway access during the project. Funding came from a mix of local, state, and federal sources, including a federal TIGER grant. Image courtesy of City of Phoenix. Half of this urban park, the largest in Downtown Phoenix, is supported by a half-mile long lid. The “deck park”, as it locally known, was built by the state department of transportation as part of the final link of Interstate 10. Consisting primarily of open landscaped areas, the park also houses a Japanese Friendship Garden, an arts center, and the Downtown library branch. Central Avenue and a light rail line run over the park at its midpoint. The park has dedicated staff and hosts large events throughout the year, including music festivals. Downtown Phoenix has a seen a recent surge in residential development, including on the park’s perimeter. Starting in 2016 the park will undergo a 10-year, $118 million face lift that will provide a greater variety of amenities such as an amphitheater, skate park, food vending, and a large water feature. The area’s resurgence and public investment will ensure Margaret T. Hance Park remains the cultural and recreational hub of central Phoenix. Overhead view of The Stitch concept. Image courtesy of Jacobs Engineering. The Atlanta Downtown Improvement District (ADID) has published the results of an engineering and visioning study for a mixed-use lid above I-75/85. 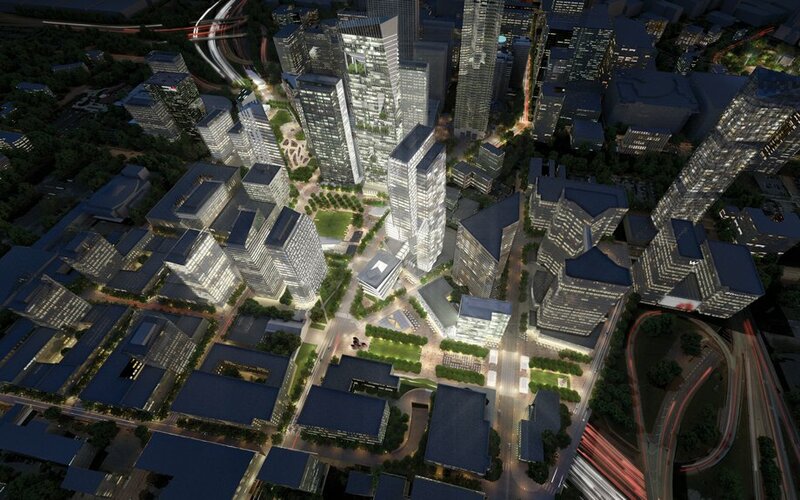 The proposal includes a rich mix of public park spaces, office towers, and residential buildings. The project would require a strong public-private partnership between multiple public agencies and developers. The next step for ADID is to raise $1 million in funding for preliminary design, which would determine how the project would be built and how much it would cost.